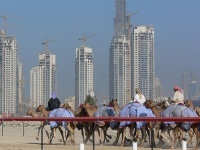 No visit to Dubai would be complete without a trip to the races - the camel races. This is a traditional sport in the UAE and hugely popular among local Emiratis who head to the race tracks early in the morning to watch these magnificent animals. The racing season runs from September to March and race tracks can be found in various locations around the Emirate and on the way to Abu Dhabi. Opening times: Thursday and Friday mornings. Call Meydon club for exact times.